How to change the color of button line? Q: I create a flip book with your flip book maker, but I find the color of button line is really not so satisfied. In this case, would you please tell me how to change that color. A: It’s common belief that color can affect mood. In other word, color is able to make your mood better or worse. So, a kind of color that you do appreciate can help you keep you happy mood all day long. 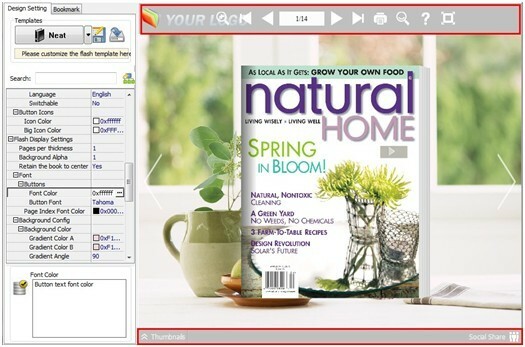 When you convert your turning book with our flip book maker, maybe you do not appreciate the color of button or button line even the font colors of default color in flip book maker. In this case, there is no need to worry that you can’t change the color you want. Now please follow our steps to change the color you like of button line. Step1: open design setting window, find out the “Bar color” line. Step2: next click the button to choose the color you appreciate. Step3: then click “Apply Change” button to check the effect of different color. 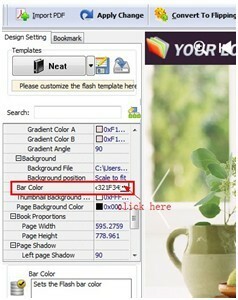 Or you still not satisfy about the color, please follow the steps and do it again. Warn Tips here: If you really can’t find a prefer one on the base color, also can customize your favorite color.